This year's Dream Festival will launch from VENICE, ITALY to KINGSTON, NY incorporating local events throughout the city, tele-matically streamed events between the two cities, and International Virtual Facebook Residencies. VENICE Events include a concert of the music of Pauline Oliveros, Dream Box "Openings", and The Venice to Kingston Carnival Dream Exchange featuring artists and venues on both continents. The Dream Festival is sponsoring two artists in residence who will be a part of the festivities as well, Musician /Composers - Björn Eriksson from Sweden and Lars Ove Fossheim from Norway will travel from their native countries in December and January to be in residence in Kingston where they will collaborate with local performers. Dates for all special events within the two month time period December 15, 2014 - February 15, 2015 will be announced ! The Dream Festival is an international celebration of dreams and dreamers curated by Kingston based author and dream facilitator Ione. Going on its 20th year, this global community event iincludes everyday dreamers and all inspired beings. The World is Our Community! Ione says, "We are honoring dreams as the source for creative solutions of all kinds leading to world harmony and balance." This year’s international Festival is sponsored by The Ministry of Maat, Inc. A not for profit 501c3 spiritual and Educational Organization for women and men with goals of worldwide harmony and balance incorporated in NY State in 1996 and located in Kingston, NY. 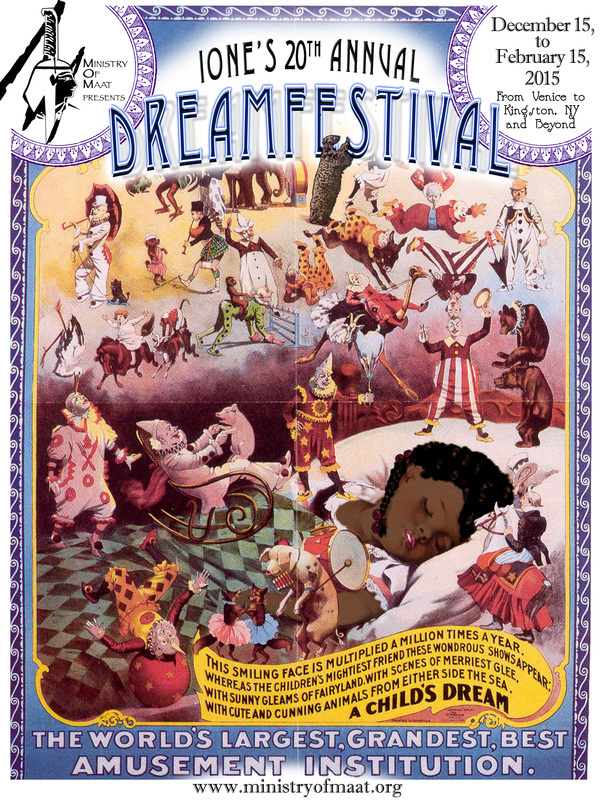 The Festival celebrates dreams with presentations of music, drumming, performance, International virtual residencies, art workshops for kids and adults, and dream telling! Dream Events will take place in Venice, Italy, Kingston NY, Poughkeepsie NY Troy NY, Brooklyn NY, Toronto CA, Paris France, Virtually with Facebook Residencies on the Dream Festival Page and always in your dreams.